Our history began with the spirit and fervor of one woman, who, in submission, never wavered in faith to the call the Lord had spoken over her life. Her spirit and zeal served as a legacy for the years to come. 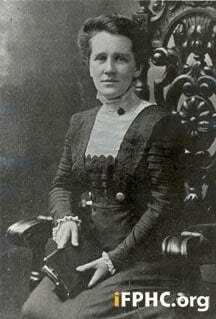 Born in Susquehanna, Pa. in 1875, Virginia E. Moss’ life was in favor with the Lord. Having been diagnosed with severe problems with her nervous system at birth and further complications thereafter, (due to a fall on ice when she was 13 years old) Moss could have died many times, but, God saw otherwise. However, years of sickness would shadow in comparison to the infilling of the Holy Spirit and miraculous healing over her body in 1904 where she consecrated her life to God. It would be shortly after receiving the baptism of the Holy Spirit that Moss would be compelled to begin holding prayer meetings (in a room) for those seeking it for themselves. Though, her Methodist pastor was initially in agreement with the nightly meetings, she would soon be ostracized by her own church. And this would lead to Moss’ growing relationship with God in search for His will for her life. God would begin to use Moss over the course of a few years, spanning from 1906 to 1909, leading hungry souls to salvation. But He would have more plans for her. In 1909, God told Moss to “take out land with stones.” It became clear to her to that this meant to buy land on which to build. She followed His direction in obedience and God laid everything before her, from the contractor, to provision for the finances, as well as the blueprint of the building. The building would be officially completed in August of 1911, and its purpose was to serve as a Rest Home (dormitory) for Moss’ students whom she taught biblical doctrine as well as an Assembly (church) so they would have a formal place for worship and fellowship. Yet once more God’s desires would be revealed in her spirit as he reminded Moss about taking out land. As she passed a few lots, the Lord said “This land is mine, a land with stones. Take out my possession.” God would continue to add to her ministry and provide the means for building a missionary training school. The land adjoining the Rest Home and Assembly was available; however, they found it necessary to buy another house and worked to join the property they had with the new ones. On October 1, 1912 the birth of the Beulah Heights Pentecostal Assembly and Bible and Missionary Training School was realized (this is the land in which we reside today). Virginia Moss would live 7 more years in jubilee (as she called it) until her death in 1919. She saw her ministry flourish as it sent forth several missionaries throughout the world. Many are well-known and continued their work through the Assemblies of God; to name a few: Maynard Ketcham, former Field Secretary to India and the Far East; Henry B. Garlick, missionary to Africa; Edgar Barrick, missionary to India; Mrs. Lillian Merian Riggs (wife of Ralph Riggs, former General Superintendent of the A/G), missionary to South Africa; and Mr. & Mrs. John Juergensen, missionaries to Japan. Under Moss’ leadership, 31 students graduated from the missionary training school and went on to their respective field work. Looking forward from Moss’ years at Beulah, the church and school would shift in leadership and further position itself with Pentecostal principles as started by Moss. The 1920s would mark a period of restructure and organization, in which to seek affiliation with the General Council of the newly formed (1914) World Assemblies of God Fellowship (or Assemblies of God as it is referred to). Beulah Heights Pentecostal Assembly would become affiliated on August 18, 1939; the church and school would then operate under the NY/NJ District. During the 1930s, Beulah would also offer a German service once a week led by Pastor David Leigh and then later taken over by Pastor Jacob E. Kistler as well as Pastor Charles Schadwinkel. The church served as a vehicle of solace, strength, and prayer to the German community in North Bergen as the Holocaust tragedy took place back home. In the 1940s, many changes would take place. The German services were no longer offered as the German population decreased in the area. On March 12, 1941, soon into his ministerial inauguration, Pastor Nicholas Nikoloff, former missionary to Poland, would sign papers to officially change the church name to Gospel Tabernacle, A/G, as we know it today. Later on in the decade, the school name would also change, to Metropolitan Bible Institute (MBI) and the teachings offered would be more diverse, adding bible-based disciplines gearing students for Evangelism, Pastor Ship, and ministry, in addition to the classes for missionary training. However, the weight of the Great Depression would linger, and financial instability would place a heavy burden on the growth of MBI. Serving as both the Pastor and Institute’s President, Pastor Nikoloff would receive news that a decision was made to move MBI to Suffern, NY. The move would prove to be a detriment to the school; what was once was a student body consisting of 80 students would plummet to an all-time low of 5 students because financial aid would not be scarce and not offered to many of the students. Sadly, MBI would officially close down in 1948. Note: The school’s closing would turn into a major merger between MBI and several other institutes that existed and become what we know today as Valley Forge Christian College. Gospel Tabernacle continued under the leadership of the Assemblies of God seeing many pastors come and go, yet still remaining as a spiritual home for the surrounding community which continued to shift. Growth, particularly with the youth, became the staple of the church during the late 70s, early into the 80s. A decision to rebuild became the mission for the 80s. The building which housed Gospel Tabernacle was completely demolished; the new building was erected and consecrated in 1984. With growth, came the cultural shift and a continued need to reach out to the neighboring communities; in 1995 a Spanish Fellowship Service would be established and flourish. Five short years later in 2000, Dr. Joseph (Pastor Joe) and Maria Santos would become the Senior Pastors (to present) and soon thereafter, Pastor Joe’s parents, Pastor Jose and Gladys Santos would become part of the Gospel Tabernacle family and head the Spanish Fellowship Service from 2002 to the present day. Under Pastor Joe’s leadership, the focus of the church has fostered a commitment to serve; the church is now known as Gospel Tabernacle: “A Church That Gives.” Through this vision, the church currently supports 40 missionaries. Additionally, seeking to reach the community through provisional support, the Pantry ministry was established in 2009; the ministry services the poor and needy by providing food to hundreds monthly. As we celebrate 100 years passed, we see the changes throughout the decades, triumphing in the many blessings from God that have allowed us to keep our doors open to the community and serve as a beacon. The words spoken to Virginia Moss, our founder, by God years ago, have left a footprint for the journey that continues and paves the way for the future. We thank God for His faithfulness and commit to purposing His will for the years to come! *There are years where there was not an active pastor.